Another disability history image thanks to the Flickr Commons project. 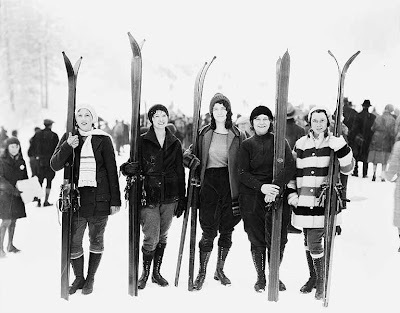 This one is from the Library of Congress's set from the George Grantham Bain Collection, news photos from 1910-1915. 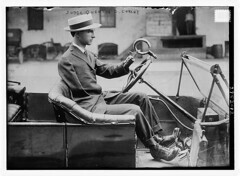 Here we see Judge Quentin D. Corley (as the title suggests), driving a very early model car with steering wheel adaptations for his prosthetic left hand; the right sleeve of his jacket appears to be empty. Corley looks to be a young man wearing a white summer hat. Quentin Durward Corley was born in 1884 in Mexia, Texas. As a young clerk in 1905, he lost both hands, his right arm, and his right shoulder in a railroad accident near Utica, New York. Corley went into a law career, passing the bar in Dallas County in 1907; in 1908 he became a justice of the peace, and in 1912 he was elected a county judge--the youngest county judge in Texas at the time. He also developed and patented the prosthetic hand he's shown using here--which allowed him to drive, type, button, cut, light a match, and write with a pen better than other available options. He toured the state of Texas alone by car to publicize his campaign for a girls' training school in the state. Corley died in 1980, age 96. The Dallas Observer's blog wrote up this photo last fall. 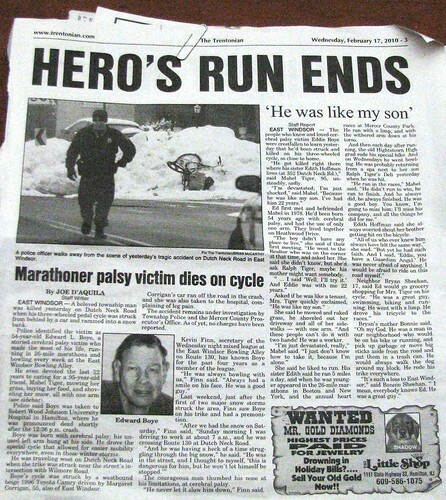 But they refer to a much earlier newspaper's treatment of the story: in 1918, under the title "Handicaps of Fate Defied by Cripples," the New York Times reported that Corley spoke a meeting at the then-new Red Cross Institute for Crippled and Disabled Men in New York City that year, intended to encourage returning World War I veterans who may have similar physical impairments. Other speakers at the meeting were Michael J. Dowling, a bank president from Olivia, Minnesota (and a triple amputee from severe frostbite in his youth); and Frederick W. Keough, a representative of the National Association of Manufacturers, who discussed the issues of rehabilitation and employment for disabled veterans. The Flickr Commons project continues to include images from the history of disability. In this 1974 color photo from the US National Archives, we see Jack Smith with his wife, seated under an "RC" sign. Jack is in a wheelchair. The couple have their arms across each other's shoulders, and Jack seems to be smiling at something Della Mae is saying. The US National Archives Flickr stream includes other photos of Jack Smith from 1974: alone, holding the family dog, with one of his young daughters, with three of his daughters, with two of his brothers, heading down the street, and working on a union poster. All the photos were taken by photojournalist Jack Corn as part of the Environmental Protection Agency's Documerica project. Jack Smith was a new coalminer in West Virginia when he lost both legs in a mine cave-in, years before these photos taken. He remained active in union work, and ran a "beer joint" with Della Mae in Rhodell, West Virginia. 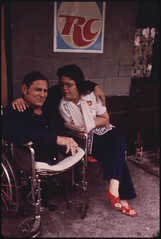 In the notes attached to one of the photos in the series, it says "During the Strike for Black Lung Benefits His Wife Wheeled Him in Front of a Train to Stop It." Two years ago, I posted about the song "Paddy's Lamentation" for St. Patrick's Day--it's a US Civil War-era song about an Irish immigrant who joins the Union Army and loses a leg in battle. This year, another Irish ballad about a disabled veteran--and his mother. Is the poor boy alive or is he dead? And in their place he's got two wooden pegs. Tore my two fine legs from the knees away. Why didn't you run from the big cannon ball? "Anytime we allow people with a disability to be treated as special people who should live or learn or work or spend their leisure time in special places, we are shutting people with a disability out of the mainstream." Happy birthday to Australian senator from Queensland, Sue Boyce, who has made disability rights issues a priority of her legislative work. She's currently serving on the committee to consider Australian immigration laws on the subject of disability. 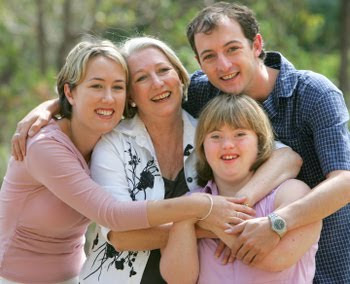 She is also a past president of the Down Syndrome Association of Queensland. Last week, she called a controversial decision of the Family Court in Brisbane concerning the sterilization of an 11-year-old disabled girl "appalling....completely discriminatory and inhumane." One dimension of a persistent social problem, originally uploaded by Edu-Tourist. Attending the first New Jersey Bike Summit last Saturday, February 27, drove home thee points for me. 1. The bicycle community is always fighting an uphill battle to gain recognition from the broader community. Solidarity is essential if we we are going to counter the predominant auto-mobility bias in contemporary transport. 2. The bicyle community can to more to recognize the physical activity needs of the disability community. The vulnerablity of disabled people, whether as pedestrians or as bike/trike riders, is vastely underrecognized. When incidents are covered, they are typically framed in the personal tragedy model. When I look at the coverage of traffic fatality "epidemic" in Toronto, Canada since January 1, 2010, I see again and again vulnerable populations, whether cane users or women with small children, getting killed. 2. I agree with bicycle activists that riding on city streets is a political act. Let's recognize our kindred, people with disabilities, who will walk or ride for enjoyment, certainly, but who are often using the streets because they have no alternative. Didn't we just post about carnival #63 last week? Indeed we did. But Athena, Ivan, and the Integral are trying something different for the March edition. They're accepting and posting submissions all month long! Go check it out, and watch it unfurl as the month does. Follow the instructions at their blog to send in a link for consideration, and to read more about what they're looking for this time. The April carnival will be hosted by Twxee at River of Jordan, and her theme idea last we talked was "balance." Think on that!